Lorraine and Richard Holden are the duo behind Mr and Mrs Celebrant. They believe that your love story is unique and your wedding ceremony should be too. Their ceremonies are highly-personalized, unique and affordable. Have an amazing wedding experience with a memory that will last a lifetime! 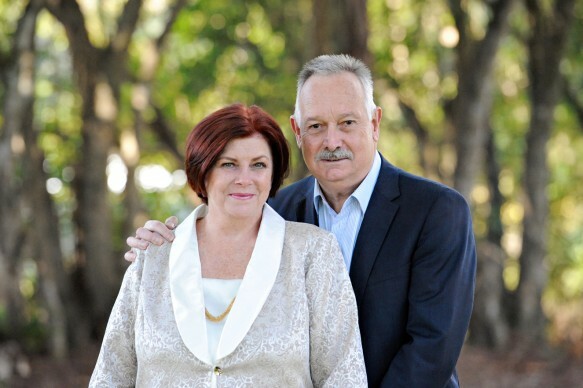 Ricard and Lorraine do marriage ceremonies from Noosa to Maleny, Montville, Flaxton Gardens and Maroochydore. They will meet with you and help you to create a wedding ceremony that is completely unique to you and your story as a couple. REVIEWS: Richard and Lorraine get some great feedback on the support and genuine care they show to their couples throughout the entire wedding process, from the planning to the ceremony itself. They have several comments from their clients on both their level of professionalism and how they were able to really personalise the ceremony to suit. ‘Beautiful, heartfelt, personal’.